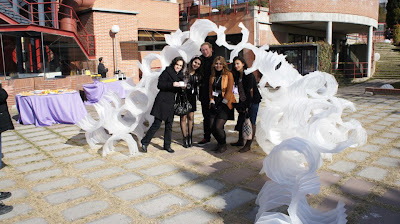 The "In 2S pace" workshop, organized by MAG LAB, took place at the UIC Barcelona on 3-14 February. The workshop provided participants to discover this beautiful city with a professional vision about its architecture and culture. From the program kick-off, the multicultural active framework facilitated live learning through site visits to of the most important Architects, universities and designers experience. The workshop explored how a digital and technologies view of design could be implemented in a real scale built product. The participants learned how to prepare their designs to be fabricated by using laser cutter, CNC and related technologies and how the awareness of the fabrication process should affect their design process from the early beginning.